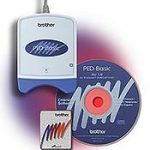 Briefly, the Brother SE-400 Computerized Embroidery and Sewing Machine is the same as the Brother SE350 with an USB Port for computer connectivity. This USB port enhancement means that you don’t need to buy expensive software and a card reader/writer when you want to expand beyond the built-in embroidery patterns. The Brother SE350 has been discontinued and replaced with the SE400. Except for the USB port, the Brother SE-400 is identical to the SE-350. The USB port on the side of the Brother SE400 connects the SE400 directly to your computer with the included USB cable. 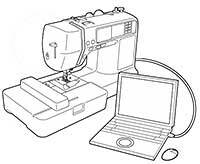 You can then download embroidery designs from your computer into the SE400 for stitching. 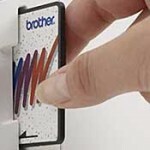 You can also upgrade the internal software in the SE400 when Brother releases a system upgrade. Note: The USB port on the Brother SE400 is the type of USB port that accepts a USB cable and attaches to a computer’s USB port. It is not compatible with a USB thumb drive or memory stick. Brother SE400 vs SE350 is really a no-brainer. The SE350 has been discontinued, but is still selling new for a price equal to or greater than the upgraded SE400. You can sometimes find a better deal, but remember to include the cost of the software and card reader/writer you’ll need to download additional embroidery designs. No matter how many built-in designs an embroidery machine has, sooner or later, you will want more. I just purchased an SE 350 off the website. I have the PE 500 right now but it’s not working. I was wondering if it has the capability to go on li I just purchased and essay 350 off a website. I have the PE 500 right now but it’s not working. I am hoping that the SE 350 will let me go to my designs that are saved on my computer and upload them to the machine. Is this a possibility?